One bedroom apartment located in Chapinero with a fully equipped open style kitchen! 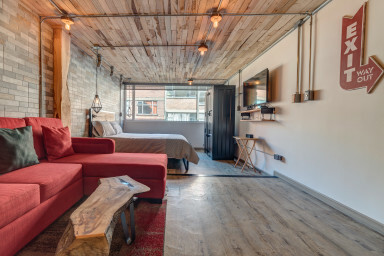 The apartment is located in Chapinero (Carrera 9A con Calle 60), one of the most central and exciting neighborhoods in Bogotá. It is a culturally diverse hot spot, full of nightlife, commerce, and universities. A definite favorite among visitors to Bogotá.